I went to print a phone card for my wife this morning, and wound up lost for a while in the “Hall of Mirrors” section of the Windows OS. 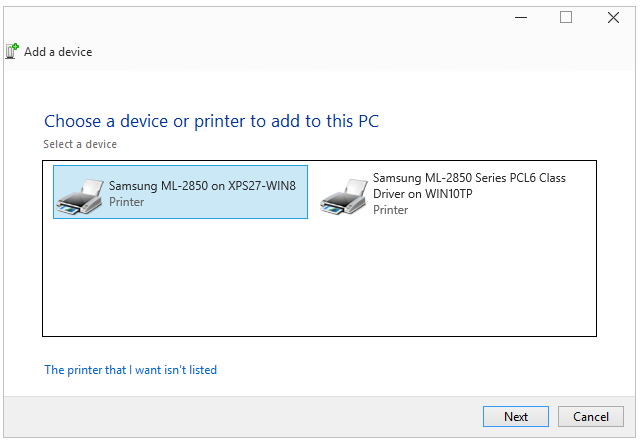 In this case, I knew I needed to print to the Dell color printer upstairs (it helps to show color on the phone card for higher visibility access to its all important access numbers and codes), but I found myself unable to access that printer from my Windows 10 test machine. After resolving some network issues (a reset of the home network with the introduction of a new high-speed boundary device from Time Warner was the culprit there) I found myself looking at a half-dozen relic printer listings from PCs no longer on the network that I knew I would never need again. So of course, I set about learning how to remove them from the Windows 10 test machine. On an AD network, this kind of thing is relatively easily handled with GPOs and scripts that will clean out stale devices. My home network doesn’t have AD, so I had to do it the old-fashioned way — namely by pruning the registry on the machine in question. I’m assuming that enough readers here have to deal with BYOD or end-user devices that may include registry entries outside the AD umbrella, so hopefully what I just learned will be of some benefit. I’d much rather see two items I can actually pick, than 6 of which I can only pick two. I wound up searching the registry for machine names for those PCs that proferred print drivers to the network, but were no longer present on the network. And lo and behold, they show in the HKCR\Local Settings\Printers\Roamed key therein, one entry per such printer that starts with the machine name for the PC that’s no longer in service or available. In my particular case, this included machine names for some PCs I’ve either sold (the Fujitsu Q704 hybrid tablet), loaned to family members (the Dell XPS12, loaned to my sister while she was recovering from a hip replacement, still not recovered), or whose OSes have been upgraded (my production PC, now running Windows 8.1, and my son’s AIO, now ditto). The upshot of all this is that now when I go into the Add Printer window on the test machine, I see only entries for printer (and shared printers) actually available on the network right now, instead of devices going back as far as the purview of the Windows registry on the machine in use (which can go back quite a ways, as some of these machines have been upgraded from Windows 7 to 8 to 8.1 and even through several preview versions of Windows 10, as on the test machine in question). I’m inclined to close this blog post with a reminder that deleting keys from the registry is irreversible unless you back them up before you remove them, so the safest course of action is always to back the whole registry up before you start messing with it. Should worst come to worst, you can simply replace the damaged results of your bungled editing efforts with the presumably pristine version you captured before you starting messing around. In my case, I wasn’t worried, because I was only messing with entries for machines no longer present on the network. Even so, I still backed up anyway. You should do likewise.